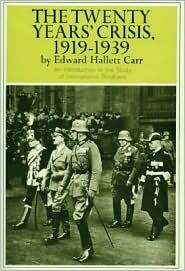 Twenty Years Crisis Research Papers discuss a book by Edward Hallett Carr that looks at interwar period of 1919 to 1939. The twenty years that Carr refers to in this work was the interwar period of 1919-1939, a period during which Carr seeks to establish that the discipline of international relations had taken a wrong turn toward a moral idealism that would lead to a second world war. Carr summarizes this assertion in his criticism of the breakdown of the utopian conception of morality. "What confronts us in international politics today is therefore nothing less than the complete bankruptcy of the conception of morality which has dominated political and economic thought for a century and a half". Carr further maintains that it was no longer possible to remain confident that the pursuit of the greatest good for the whole world by every state constitutes the pursuit of the greatest good for their citizens or vice versa. Carr’s work is clearly a critique of both nineteenth century and twentieth century international thought, especially of what he labeled utopian thought. His work also serves as an account of how power, law and morality have played a significant role in international relations and ultimately in international conflict. Carr’s analysis offers some valid arguments against the doctrine of interwar utopianism based largely on what he perceived as its primary flaws or defects. From the start, Carr maintains that the utopian thought that influenced the science of international politics during the interwar period failed to consider facts as well as failed to apply analysis of cause and effect, failures that Carr attributes to the utopian focus on the end to be achieved in international relations, which was the prevention of another war like the first world war and was symbolized in the Peace Conference and President Wilson’s conception of the League of Nations. Carr also charges that the utopian thinkers of the period were flawed in their underestimation of the significant role that power plays in international politics as well as in their overestimation of the role of law and morality. On power, Carr points to Great Britain’s ability to settle its military and economic power in Egypt with the formal independence of the country, where a less powerful nation would have likely been forced to annexation in order to achieve and maintain hospitable relations. Paper Masters writes custom research papers on Twenty Years Crisis and discuss a book by Edward Hallett Carr that looks at interwar period of 1919 to 1939.